The only way for your little one to be seen around town is with this adorable Deluxe Pram by Molly Dolly. 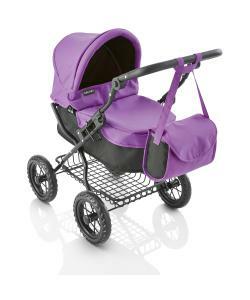 The stylish purple & black design is eye-catching and stands out from other doll prams. Not only does it come with a pull-over hood and handy changing bag, but it also comes with storage space underneath... perfect for holding accessories or shopping. The pram encourages responsibility and imaginative play. This deluxe pram is a traditional classic styled dolls pram with an extra strong steel chassis and a sturdy body with a padded handle for comfort. The handle height easily adjusts from 50cm - 77cm, and the whole pram collapses down for easy storage.